Today is the end of the school year and my eldest took himself off to Toulouse for the weekend. Not without a last minute panic of 'mum, I need a cozzie for the swimming pool, can we go to Intersport?'. No, we couldn't go to Intersport. It was either we go to Intersport and get a cozzie and miss the train or get on the train minus cozzie. When put to him, he voted for the latter but I think he secretly he believed he had time to do both. He is his father's son. I dropped him off at the tram station and left him to it. He seems quite capable of negotiating his way around train stations, including Gare de Lyon, so I declined from driving him through the ghastly traffic and road works to the station when he is quite able of getting there himself on the tram, finding the right train and his seat. I suppose it's a rite of passage, this - end of collège, bid for independence and freedom. He's looking forward to a month of July full of his mates, sleeping at other people's houses, having friends sleep at ours, swimming in the river, dossing about and eating as much bread and Nutella and pipa (sunflower seeds) as he can. Heady days. I have a plan to get him to manage his bread eating habits himself. I'm going to teach him how to make soda bread which is ridiculously easy, and then he can whip up a batch in less than an hour and be stuffing his face while I'm peacefully oblivious at work. 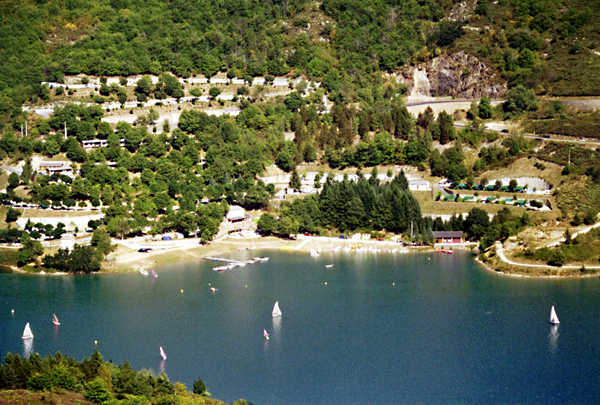 We will also be heading off on holiday, camping in a chalet near Villefort in Lozère. It is camping de luxe with air con and a dishwasher. Mum's on holiday too! The boys love camp sites what with their pools, activities and night-time entertainment, potential friends and space to do nothing in particular. The chalet even has an oven so we'll be able to make soda bread there too. Buying endless baguettes gets very expensive. I'm looking forward to it. We usually go to the UK but this year I had to maintain the car which ate up all the travel money (and some) so it's up the road for us on the edge of a stunning reservoir surrounded by pine-covered hills, a dam, viaduct, and bridge - all very dramatic. Meanwhile, my youngest is looking forward to being an only child for the weekend and take charge of the tele remote, the best spot on the sofa and not sharing anything. I can already feel the stresses of the school year start to melt away. Long live the summer!